Foxtel has signed a deal with US TV giant HBO to bring popular series like True Blood to Australian screens within hours of them airing in the US, according to a report in The Australian. The landmark deal will lock free-to-air networks out of HBO’s catalogue of acclaimed programming and reduce the impetus for piracy by making the content available before it is available to download illegally. Currently Australian audiences wait up to a year before US shows are aired on local television, fuelling widespread piracy of popular programming. “It’s a long-term deal and we get all first-run HBO programming on Foxtel,” chief executive of the pay-TV network, Richard Freudenstein, told The Australian. 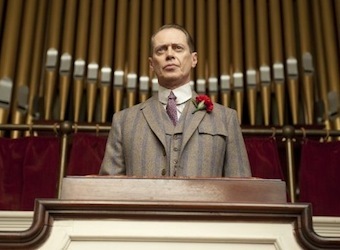 “You won’t see programs like Boardwalk Empire end up on SBS in a couple of years. It removes their ability to sell in a second window to free-to-air television. That won’t happen any more. You won’t see those programs on free-to-air. The deal will make HBO’s programming, including recent hits Game of Thrones, Girls, True Blood, and Veep, available in high definition, a further benefit over pirated versions. The pay-TV operator will also launch ‘Foxtel Go’ next month, an iPad app offering subscribers 21 channels free of charge, making a raft of content including HBO’s available on demand via mobile device. “We’ve got all the rights we want for catch-up TV, tablet and IPTV [internet via television] free on demand to customers,” Freudenstein commented. HBO content will premiere on Foxtel’s premium drama channel Showcase, which will be marketed as the ‘home of HBO’. Subscribers will also be able to watch a library of classic shows such as The Sopranos and Six Feet Under. Foxtel aims to increase its penetration in Australian households from about 34% to 50% by 2017.